Heard of 2-way radio? Walkie talkies? Well, Adromeda Digital have created a totally new genre… a SmartRadio. This combines the 2-way radio experience of using Direct radio communication with a WiFi and 4G enabled smartphone capable of running push-to-talk apps. There’s nothing like it out there and it’s something that’s set to revolutionise the communications ofthe security, events and emergency services sectors. Working closely with the client, we created the concept of a new generation of such devices – the 3-way SmartRadio. When Networks don’t work. Only Andromeda SmartRadio with Direct Mode will keep you connected. 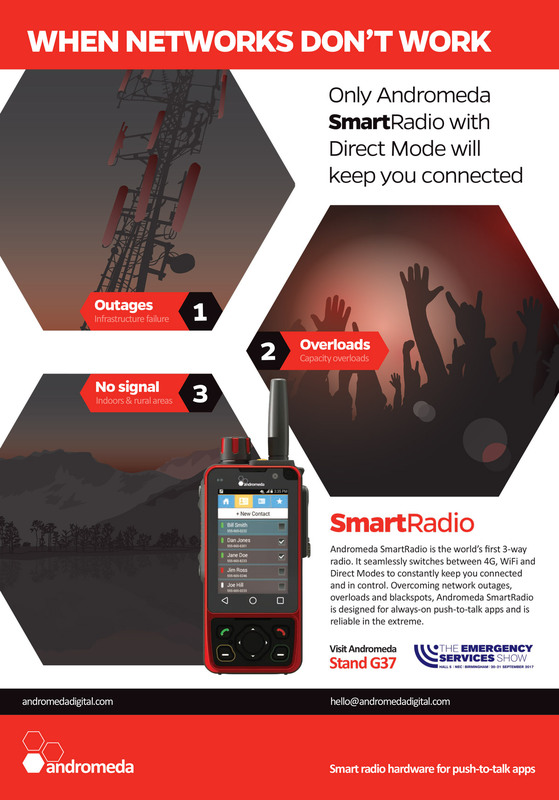 Andromeda SmartRadio is the world’s first 3-way radio. It seamlessly switches between 4G, WiFi and Direct Modes to constantly keep you connected and in control. Overcoming network outages, overloads and blackspots, Andromeda SmartRadio is designed for push-talk apps and is reliable in the extreme.